The recent strength of the U.S. dollar over the Colombian peso has made property in Medellín a real bargain. I’ve just completed a detailed survey of four neighborhoods in Medellín—neighborhoods popular with expats—and found that the average price for existing properties in these neighborhoods is 2.5 million Colombian pesos (US$960) per square meter. I’ve seen several publications in the United States use the real estate costs in El Poblado to represent the overall market in Medellín, but this is not accurate as El Poblado is the most expensive neighborhood in Medellín. There are several others that also offer a high quality of life… but with a lower property cost. Many publications also quote prices only in U.S. dollars, which isn’t appropriate because properties in Colombia always trade in Colombian pesos. The exchange rate has changed dramatically over the past few months, which make price quotes in dollars go quickly out of date. The dollar is up about 10% in the past month and up over 30% in the past year. We surveyed 400 existing real estate properties—sized from 70 to 100 square meters—in Medellín’s neighborhoods of El Poblado, Envigado, Laureles-Estadio, and Belén. We analyzed 100 properties in each of the four neighborhoods, chosen because they’re the most popular in the city for foreigners and expats. Within these neighborhoods, we included only two- and three-bedroom properties in the socioeconomic sectors where expats would likely settle. For purposes of the survey, all properties are resales; new construction was not used. Not surprisingly, El Poblado has the most expensive property, averaging 2.9 million pesos (US$1,120) per square meter. Envigado properties on average were 9.4% cheaper, while properties in Laureles-Estadio were 31.2% cheaper and properties in Belén were 34.5% cheaper than El Poblado. We also noted a wide range of property prices within the same neighborhood. For example, in El Poblado, the existing properties we surveyed ranged in price from 1.9 million to 4.3 million pesos per square meter. Properties priced at the lower end tend to be fixer-uppers needing some work. 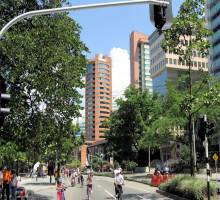 Most of the expats owning property in Medellín are in the upscale neighborhood of El Poblado. The majority of the hotels and rental apartments in Medellín are also located in El Poblado because this is where most visitors to the city stay. And while the average cost in El Poblado is 2.9 million pesos (US$1,120) per square meter for existing construction, we found that new construction is far more expensive, costing around 4 million to 5 million pesos (US$1,534 to US$1,918) per square meter. Most of the housing in El Poblado is found in high-rise apartments, many of which have spectacular views of the city. El Poblado does also have some streets lined with one-, two-, and three-story homes located in certain neighborhoods like Provenza. El Poblado is popular with foreigners—and wealthy Colombians—as it’s a comfortable place to live, with shopping malls, nightlife, and restaurants close at hand. It’s also considered one of the safest neighborhoods in Medellín. With El Poblado being so popular with expats, an active apartment rental market also exists. This is why many property purchases by foreigners are rented-out investment properties. A rental apartment in a good location in El Poblado can achieve occupancies of 80% or higher. The bottom line is that El Poblado is a wealthy neighborhood that offers safe streets and a Western lifestyle, which is why it continues to be so popular. Some expats have also discovered Envigado, located directly south of El Poblado, where real estate can be somewhat cheaper by comparison. In our survey we found properties are 9.4% cheaper on average than in El Poblado, with an average cost of 2.7 million pesos (US$1,024) per square meter. Prices for new apartments in Envigado can range from about 1.3 million to over 4 million pesos (US$499 to US$1,534) per square meter. This is a pretty wide range that is driven by the socioeconomic category of the neighborhood as well as the quality, location, and view from the property. The lowest priced new housing is typically located in poor neighborhoods, where foreigners normally don’t feel comfortable living. While El Poblado is a neighborhood of Medellín, Envigado is a separately administered city within the Medellín Metro Area. Envigado is also larger than El Poblado, with a population of nearly 200,000 compared to El Poblado’s 124,000. Envigado is primarily a residential community, so you won’t yet find as many hotels in Envigado as you will throughout El Poblado. But it does have a few zones that offer a good selection of restaurants and cafes… zones that even draw visitors from nearby El Poblado. Envigado has a few neighborhoods similar to El Poblado with modern high-rise apartment buildings. But, throughout most of Envigado, you find quiet streets lined with one-, two-, and three-story homes that would be unusual in El Poblado. Envigado also has height restrictions in place that prohibit many of these low-rise buildings from being replaced with high-rises. Some expats have also discovered Laureles, located north of Belén and west of the Medellín River, where existing real estate in our survey costs an average of 2.2 million pesos (US$854) per square meter. This is 31.2% less than El Poblado. Laureles-Estadio is an older neighborhood without many new apartments being built. New apartments, when they can be found, are typically in the range of 2.8 million to 4 million pesos (US$1,074 to US$1,534) per square meter. The city of Medellín groups Laureles with Estadio, into comuna number 11. The Laureles-Estadio comuna has a population of about 121,000… slightly smaller than El Poblado. Laureles-Estadio is primarily a residential community. So, again, you won’t find many hotels in the area like are found throughout El Poblado. In Laureles-Estadio, you find a few neighborhoods similar to El Poblado with high-rise apartment buildings. But, throughout most of Laureles-Estadio, you see quiet, tree-lined streets with one-, two-, and three-story homes. Some expats are beginning to discover Belén, located west of the Medellín River. Here, the existing real estate in our survey costs just 2.2 million pesos (US$833) per square meter, which is 34.5% less than El Poblado. New apartments are typically in the range of 2.8 million to 4 million pesos (US$1,074 to US$1,534) per square meter. Belén in general is an older neighborhood, but it does have one barrio, Loma de los Bernal, which has seen a recent building boom of new apartment buildings. Belén is comuna number 16 and has a population of over 194,000 compared to a population of 124,000 in El Poblado. It’s a working-class community and is one of the city’s oldest neighborhoods. You can find a few areas similar to El Poblado with high-rise apartment buildings, but throughout much of Belén you find quiet streets with one-, two-, and three-story homes. Some of the barrios most popular with foreigners in Belén include Fatima and Rosales, which are close to the Unicentro mall and Metroplus stations for easy transport, as well as Loma de los Bernal with its recent apartment construction boom. 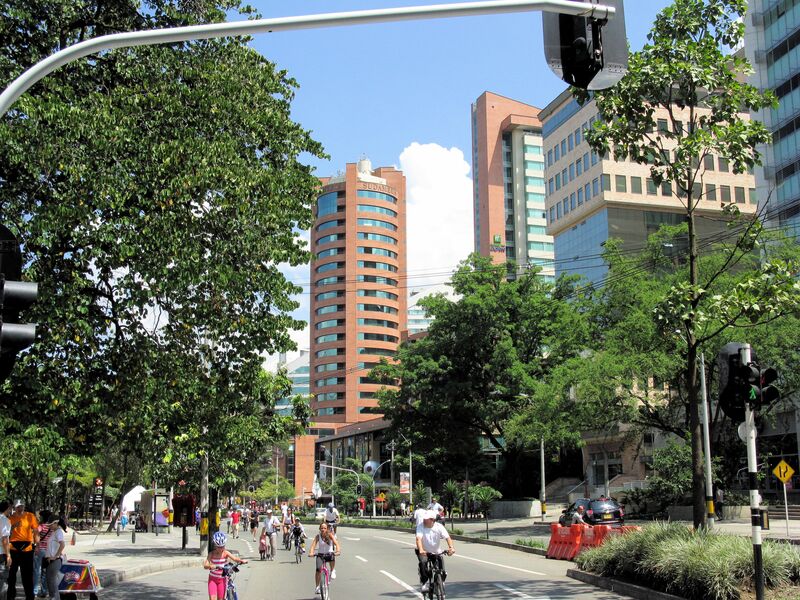 While El Poblado is expected to remain the most popular neighborhood in Medellín for expats, Envigado, Laureles-Estadio, and Belén are attractive alternatives with lower-priced real estate. Based on our survey, it is possible to save over 30% in Laureles-Estadio and Belén compared to the average costs of real estate in El Poblado. The current exchange rate makes real estate prices in Medellín a real bargain, perhaps even the best real estate deal on the planet. If you want to save over 30% on Medellín real estate compared to over a year ago, this is your opportunity. Editor’s Note: Our preferred real estate contact in Medellín is Rich Holman of First American Realty Medellín. I like Rich’s outfit because they have a huge inventory, English-speaking agents, and a good property management division. Jeff Paschke first discovered Colombia back in 2006 and has traveled to all the major cities in Colombia. He is fortunate to have an analyst job in the United States with location flexibility, which has allowed him to spend nearly four years living in Medellín. Jeff has lived in four different neighborhoods in Medellín and knows the city well. He is also studying Spanish to become fluent. In Uruguay, we are being told that five months’ rent as a security deposit is a non-negotiable item in a long term lease. Is this true? Add on the one month of rent due as commission to the rental agent, plus the first month’s rent, and that adds up to a substantial amount of money at the outset. Please clarify, and, if possible, suggest one or more English-speaking realtors who can help us with this. I spoke with Veronica Algorta, who is a real estate agent and property manager in Uruguay. In fact, Veronica (who speaks English) is the owner of the apartment I stayed in last month in Montevideo. She says that the normal deposit is three months’ rent, when renting an unfurnished apartment on a yearly contract, although it’s legal to ask for more. Asking for more than three months is more common with foreigners, who may have no other assets in Uruguay (like a car, bank accounts, or property), or Uruguayans who have no appreciable assets. Keep in mind that, in Uruguay, renters’ rights are very strong. If you’re renting an apartment, it’s difficult to get rid of you for nonpayment or any other reason. Hence the large deposit. Another agent-manager I work with in Montevideo is Bettina Stratta of Reynolds Properties. If I were to go to Ecuador and choose three different locations for a month each, could I get a fairly cheap rental, or would I have to stay at a hotel? It really depends on where you’re going in Ecuador. For mature markets like Cuenca and Quito—or Salinas and Playas on the coast—you can easily get a short-term rental. I’ve also found them in Vilcabamba. Take a look at Cuenca Rentals as an example of a good furnished rental agent. In the smaller cities like Loja, it won’t be easy. By the time you find a realtor who actually shows up for an appointment, you’re month in the city will likely be half-over. Have a question? You can write to Lee (or Jeff) here.